Last week we looked at chopping back deciduous trees in the ground to create taper and movement. 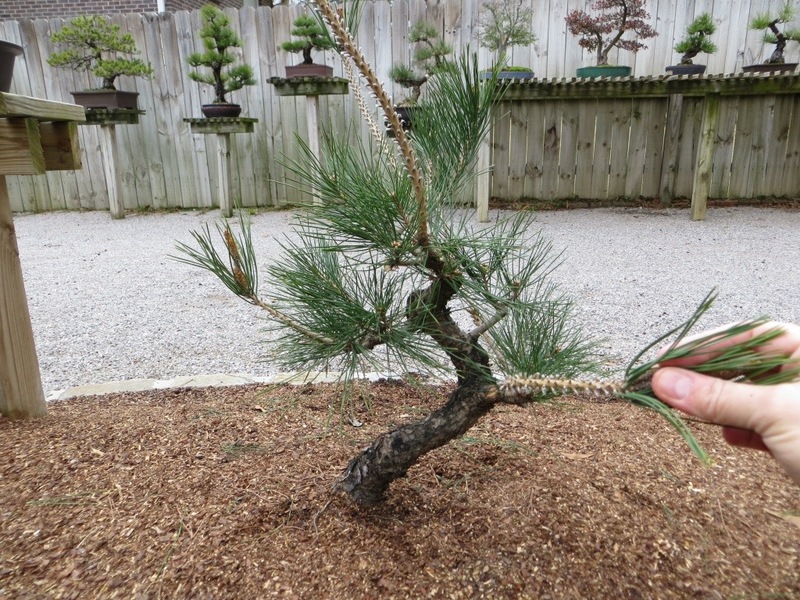 This week, we will take a look at the same technique, but on a black pine…where the method is somewhat different. 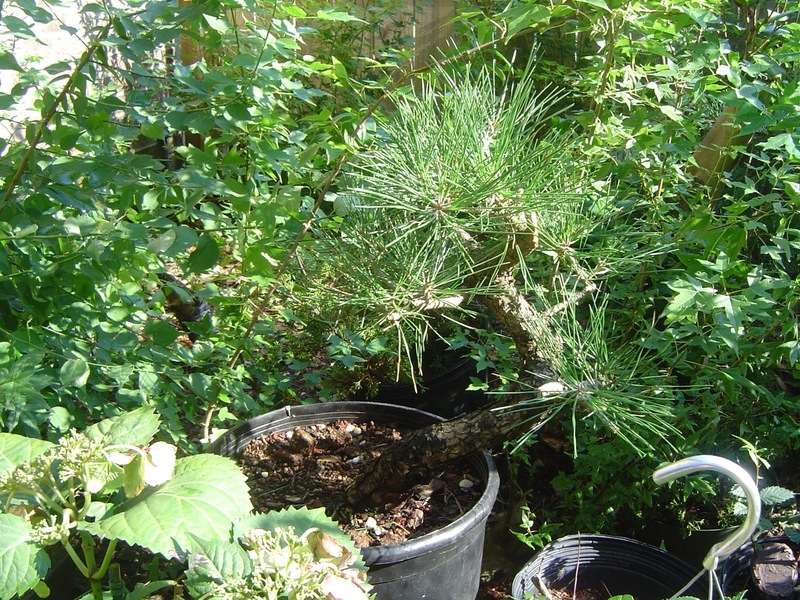 This tree is a 10-year old, purchased a few years ago from Brussel’s, in a 5-gallon nursery can. Last year I stuck it in the ground to experiment with the growth rate. It grew pretty well, and the number of buds set for this year suggests its pretty happy where it is. 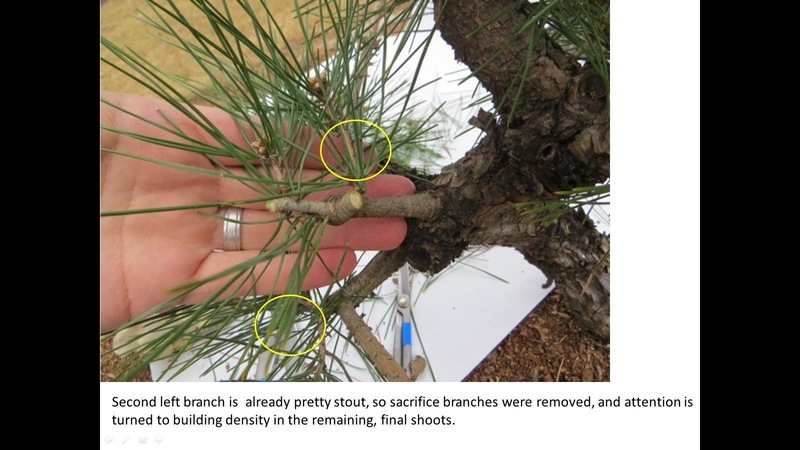 With pines growing out, we need to identify each shoot as a “final” branch, or a “sacrifice branch. They’re treated in nearly opposite manners. This is the key concept for this article, which is essentially a pictorial version of Brent’s excellent article written a few years ago on the subject. 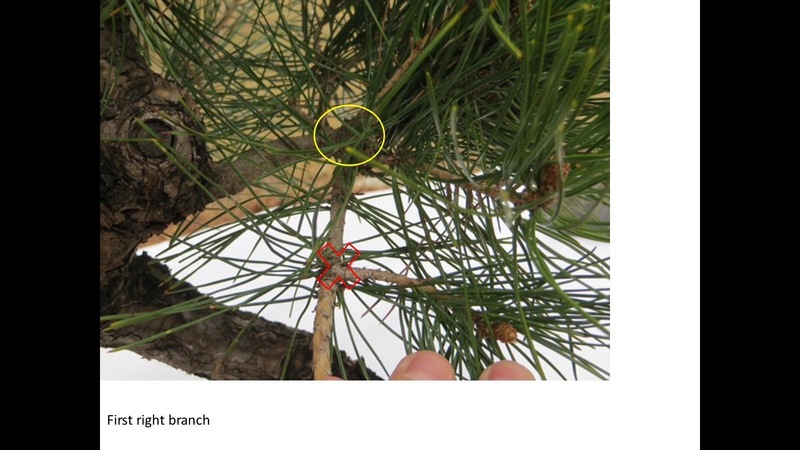 Throughout the photos, final branches are circled in yellow, sacrifice branches are identified with a red X. 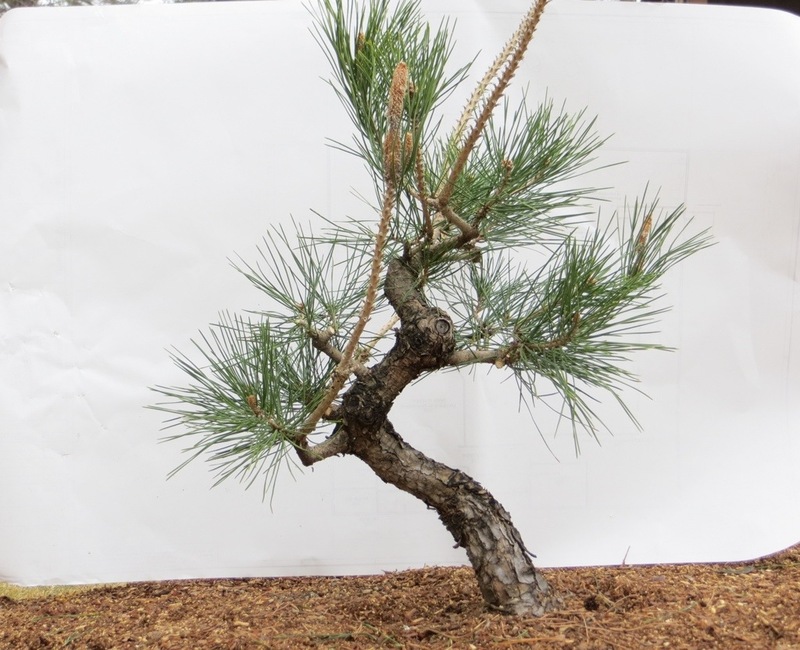 Final branches are trained by regular pruning back to develop denser ramification close to the trunk. 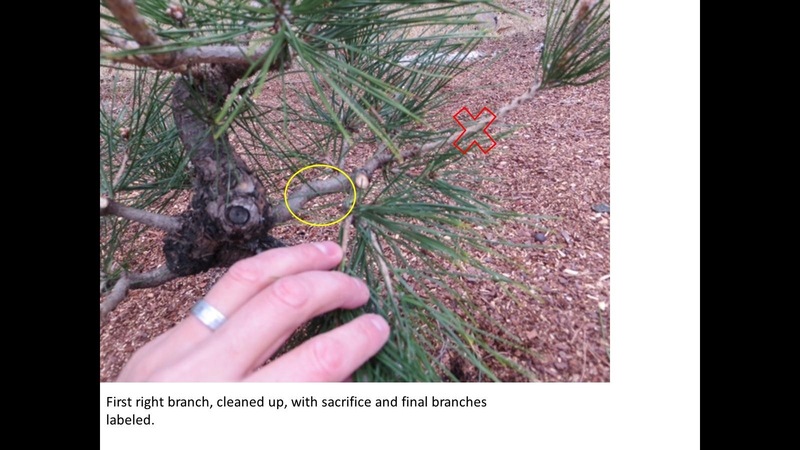 Sometimes these final branches have a sacrifice shoot as well, to hasten the thickening. 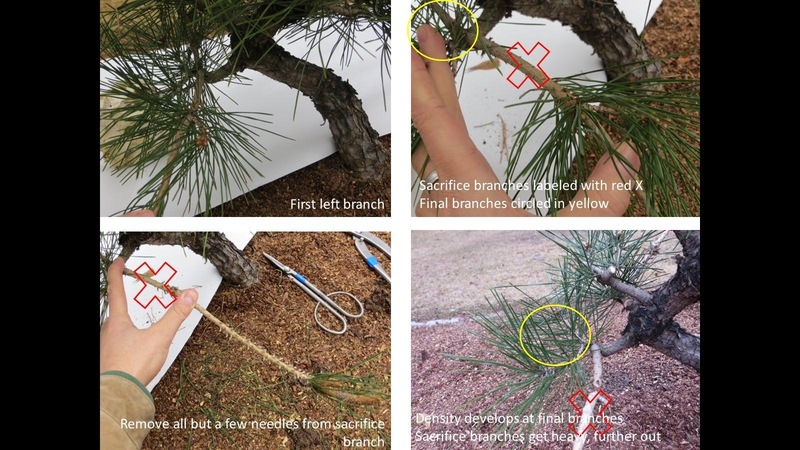 Sacrifice branches are encouraged to run, grow strong, and are ultimately removed (ideally from the back), and won’t be part of the finished design. It’s important to remember which is which. Trimming sacrifice branches slow things down, and letting final branches run wild may ruin the fine branching. 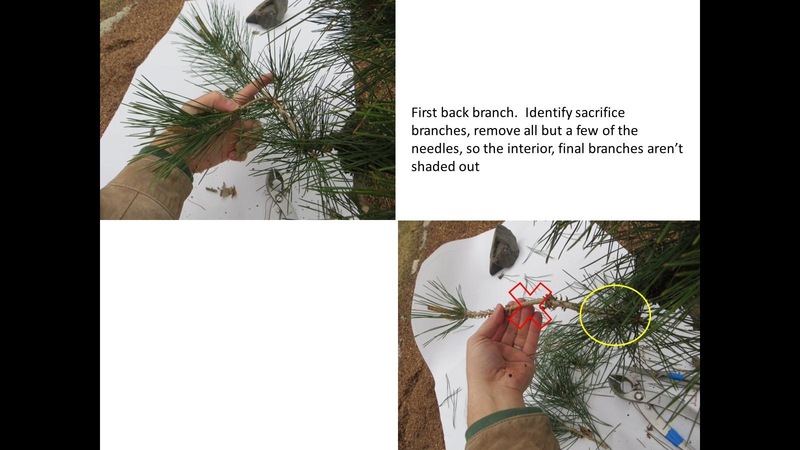 Mark final branches with twist-ties if you are inclined to forget. Now that we’ve had proper introductions, lets get started! This brings us to the apex. 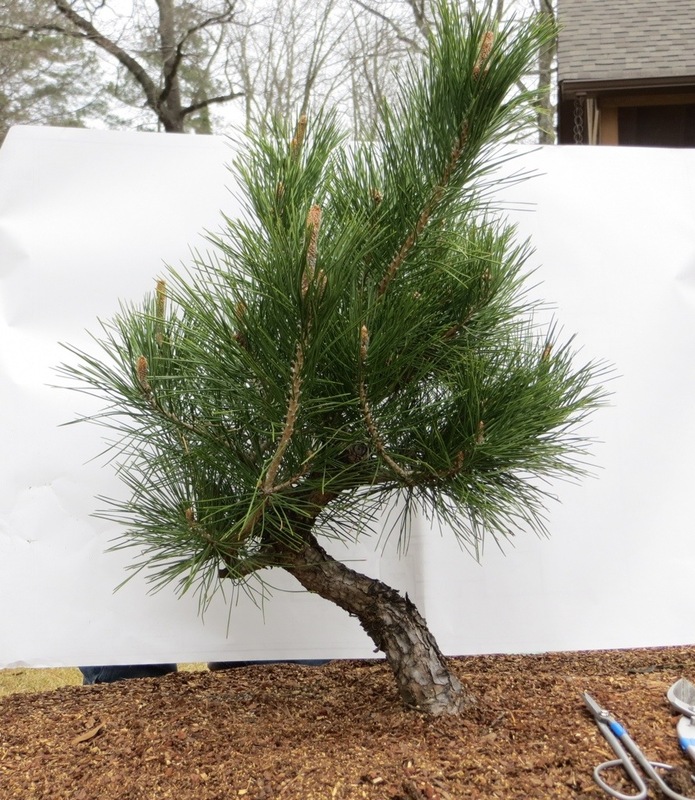 With pines, it’s important to prevent too many branches to emerge from one location. Best to reduce to 3 at most (an heir and a spare, then the sacrifice). 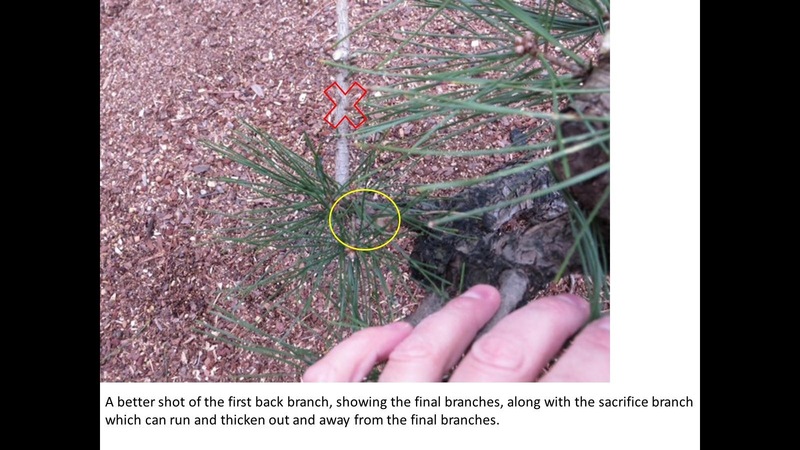 If possible, keep a sacrifice branch emerging from a spot that ensures the eventual pruning cut will be toward the back. It’s difficult to see, but two branches were removed at the left, and three remain that move toward the right. The one closest to the 12:00 position emerges toward the back, and will be the sacrifice branch. 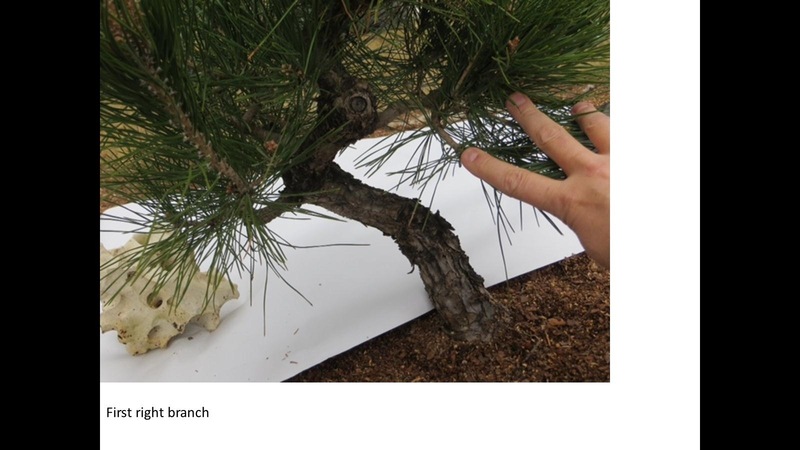 The one at 2:00 is the right-facing final branch, and the one at 4:00 is the next trunk section. 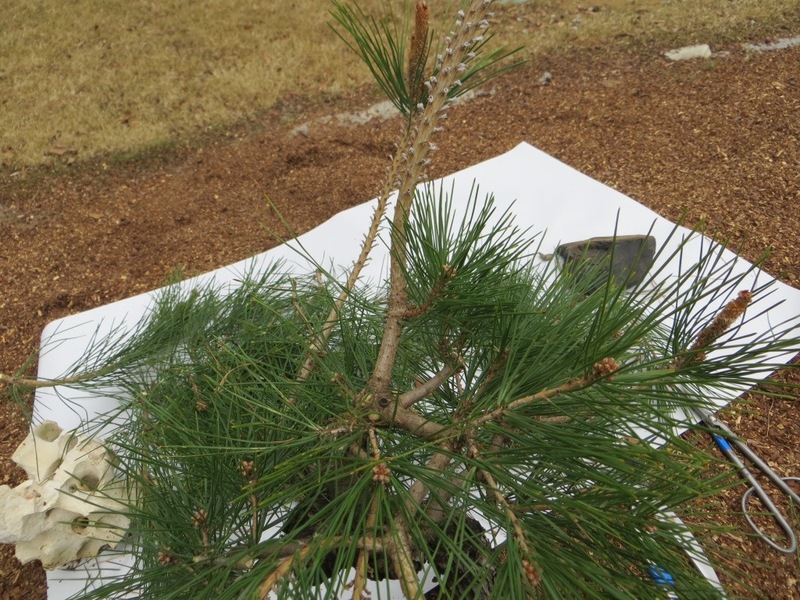 In the end, the tree was reduced by about 50%, and looks like a wet cat, but we’ll check in on it again in a few months and see how things are going! Awesome! education top-notch. thanks, I’ll be checking back. Just came across your blog, Brian and it’s very useful reading. I appreciated this pictorial approach to your instruction – very clear to follow. 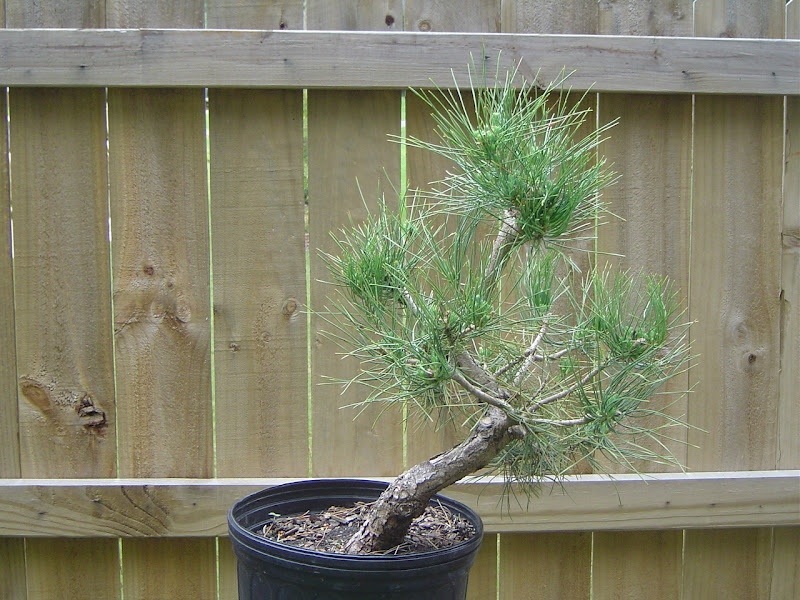 A heard a bonsai professional once say that’s not enough to have a 5 year plan for your tree, you should have one for every single branch on the tree – this post sums that up pretty well. Thanks!